OAM stands for Operations, Administration, Maintenance , and Ethernet OAM should be considered as an Ethernet operation management tool. The original motivation was to "make the carrier easier to manage the Ethernet network to promote Ethernet carrier service, " but it is also applicable to internal NW etc.IEEE, ITU-T, MEF began to formulate standards for this Ethernet OAM formulation.Finally, the following three are standardized. Examples of the range of each of EFM OAM, CFM, E-LMI are shown below. IEEE 802.3ah is a standard group for the dissemination of Ethernet carrier services, also known as EFM (Ethernet in First Mile).IEEE802.3ah specifies the optical fiber standards used in FTTH, and the OAM function is also one of the standards within IEEE 802.3ah. For CFM, IEEE 802.1 and ITU-T / MEF independently developed similar functions.Ultimately, IEEE802.1ag and ITU-T Y.1731 are quite similar, as there are places that have been prepared in line.The main difference is that there are several different terms and Y.1731 has a tool that can perform performance evaluation (performance measurement). 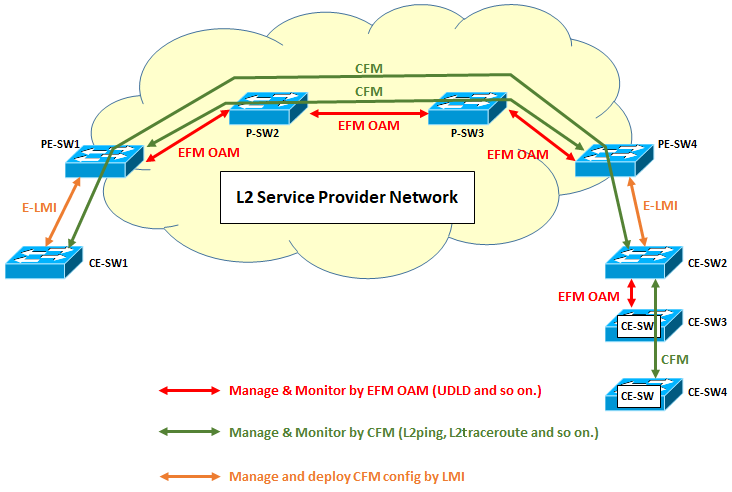 E-LMI inherits the concept and role of Frame Relay LMI.Assuming that it interoperates with CFM , the L2 service provider can monitor the state of customer switch (CE - SW: Customer Edge Switch) and automatically send the setting required for CFM. So, if the customer sets one line in the SW, the CFM setting information is automatically paid out from the service provider, so the tool with the CFM command can be easily used.